While there is a whole nest of contact lenses when it comes to replacement cycles – monthly replacement, 2-week replacement daily disposable – it may not be easy selecting the right lenses for astigmatic patients. While there are viable options such as daily replacement lenses, you still need the best options that will provide good vision, comfort, and ocular surface. This should also fit in well with your budget, lifestyle and convenience needs. Whether you have been a lens wearer for the past few years or just about trying your hands on them, you need to select lenses that make lens care and replacement as convenient as possible. 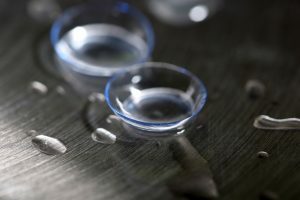 As a result, we have found that daily disposable and monthly replacement lenses tend to perform well for this purpose. Although monthly disposable lenses are very popular among lens wearers, daily replacement lenses offer more benefits and advantages. First, these lenses are more hygienic. In most cases, you’ll find it easier and more convenient to put on fresh contact lenses every morning. Not only are you safe from the risks of eye infections, but you won’t have to bother with cleaning and disinfecting the lenses. After using your contact lenses for a whole day, you are itching to have a new, fresh pair so that the chances of forgetting when to change them is slim. Most importantly, the materials and parameters in daily replacement lenses are extensive than what is in monthly disposable lenses. For these reasons, the daily replacement lenses are the most appealing choices, especially for astigmatic patients. The Dailies Aquacomfort Plus Toric contact lenses have dual thin-zones that utilize the blinking pressure of the upper and lower eyelids. And because the lens profile is thinner at the top and bottom, it is able to maintain rotational pressure. This allows the lenses to move with the eyes, resulting in less discomfort. This also accounts for why many users don’t feel they are wearing them even when they engage in physical activities. These contact lenses have stable on-eye performance, thanks to the 5o oscillation with each blink. This design ensures that the contact lenses don’t clash with your eyes when you blink. This is important for a stable, crisp and clear vision. The Dailies Aquacomfort Plus Toric, like other toric contact lenses, come with a design that can help you relieve any distress that comes with wearing contact lenses. As an astigmatic patient, it can be difficult to maintain a good hold on your contact lenses for more than 5 hours. However, with toric contact lenses like the Dailies Aquacomfort Plus Toric lenses, you should be able to wear your contact lenses for more 5 hours in a role without the discomfort that accompanies astigmatism. The contact lenses feature HPMC – a lubricant that provides instant comfort upon application of the lenses in your eyes. The Propylene Glycol material is responsible for coating and conditioning the surface of the lens through a gradual release of moisturizing agents all-through the period you wear the contact lenses. This creates a long-lasting fluid layer that helps to maintain optimal lens lubricity and improve the comfort of the lens/eye interface. The Dailies Aquacomfort Plus Toric contact lenses come with a Precision Curve lens design that provides clear & crisp vision along with an excellent stability. This is as a result of 99% of the Dailies Aquacomfort Plus Toric contact lenses having less than 50 oscillation with blink. In fact, this is one of the distinguishing features of toric lenses. When inserted, these contact lenses also boast of optimal fit, which is important for a quicker insertion. With only 1 diameter and base curve, these contact lenses make for a quick and easy fitting. They also contain scribe marks at 3 and 9 for measured rotation and o’clock positions for accurate fitting. These daily contact lenses have blink-activated moisture technology which allows the eyes to breathe naturally while keeping it wet and fresh throughout the day. Each lens contains a PVA polymer, a unique daily disposable material. They keep the lens in good compliance with the manufacturer replacement frequency. This means that each contact lens that goes on your eye will help relieve discomfort, keep your eye moist and fresh as long as you replace them at the appropriate time. These daily disposable contact lenses from Alcon contains up to 67% of lotrafilcon B and 33% of water. The lotrafilcon B is a silicone hydrogel material that helps in reducing the risk of eye infection by creating a resistance to protein deposits as well as delivering less drying of the lenses. It also helps in reducing the risks of conditions like hypoxia to your cornea due to its high dk levels. 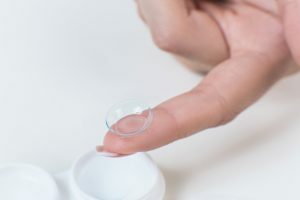 While it is easy to mull over the cost of contact lenses (especially toric contact lenses), there are a few reasons you may want to get them over eyeglasses. Unlike eyeglasses, you buy contact lenses for specific eye problems. While they are not fashionable, they tend to suit your style, convenience, and budget better. 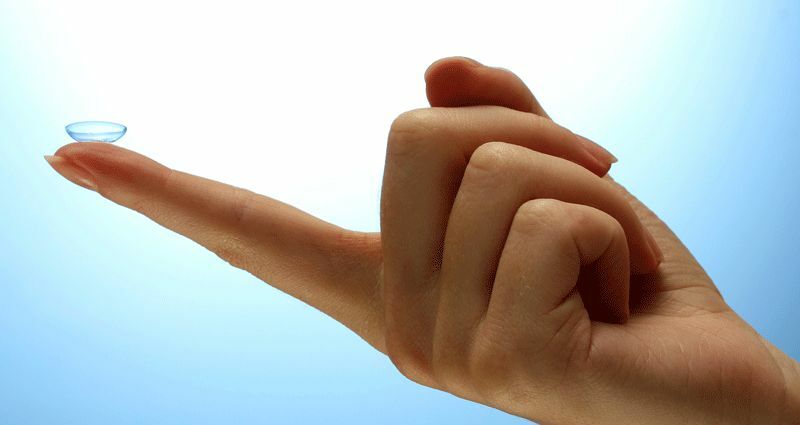 Usually, the type of contact you choose, your style, how frequently you replace them, and where you buy them will determine the price you end up paying. Some retailers offer discounts or rebates so you may want to look out for that. When researching the pricing options for these lenses, we discover some of the most popular online retailers are offering the lenses at a retail price of $50 up to $85 for a box of 90 contact lenses. One of the retailers we found offering the Dailies Aquacomfort Plus Toric 90 Pack contact lenses with free shipping is Coastal.com with a price match guarantee so you can get the best deal. According to the retailer, the contact lenses should arrive your doorstep in 6 to 7 business days. The Dailies Aquacomfort Plus Toric contact lenses are designed for astigmatic patients who want the convenience of daily disposable contact lenses. They are suitable for you if you work long hours on a computer or in an air-conditioned environment. These contact lenses provide comfort with each and every blink, making them perfect for you if you have allergies. They give you crisp, clear vision throughout the day and they don’t require any cleaning or disinfecting. Here, we’ll go over some of the important aspects of the Dailies Aquacomfort Plus Toric contact lenses. This is based on the reviews of previous users so you can understand how these work better and what you are likely to experience. What’s the visual quality after wearing these lenses? They feature LightStream technology that provides and consistent flow of oxygen to the eye. This is what your eyes need to be safe from dryness and possible discomfort. The tinting also allows for simpler handling, which is important if this is your first time of buying contact lenses. They come with HPMC, a lubricant that provides instant comfort upon application to the eyes and helps provide superior tear film stability for your comfort and visual acuity. 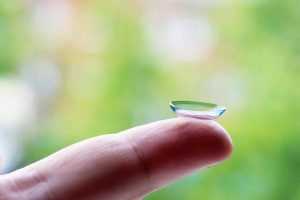 When you wear a silicone hydrogel contact lens like the contact lenses, you are likely to have a higher level of satisfaction. And this comes along with emotional benefits which can boost your confidence and happiness as an astigmatic sufferer. In essence, these contact lenses can reduce your reliance on eyeglasses while giving you an excellent alternative without discomfort. Are these lenses suitable for sensitive eyes? To keep your eyes functioning properly and healthy, you need to ensure you are getting the appropriate dosage of oxygen to the cornea, which is derived from the air as opposed to the blood passing through the blood vessels. This is why you should wear contact lenses that supply oxygen to the cornea at a high percentage. These contact lenses feature a patented technology that creates a deposit-resistant surface. This then helps in protecting the eyes from eye diseases arising from wearing contact lenses. 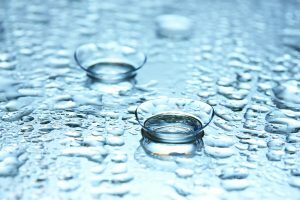 The lenses have the highly breathable silicone hydrogel – a water-loving plastic material that’s rigid when dried but pliable and soft when wet. This material is responsible for correcting astigmatism whether it’s lenticular, cornea or the combination of both. What’s the comfort & fit like? The manufacturer of the Dailies Aquacomfort Plus Toric is Alcon. And according to them, they can provide up to 5x more oxygen to your eyes than other soft contact lenses. For our eyes to maintain their proper function and health, they need to breathe. This means that there should be enough supply of oxygen to the cornea. This oxygen is often derived from the air instead of the blood passing through our vessel. These daily lenses have superior tear film stability, which is important for comfort and a safe visual acuity. So, you can work on your computer or even drive without the lenses falling out or obstructing your view. Another worthy advantage of the Dailies Aquacomfort Plus Toric contact lenses is that they provide a stable vision. Even when you are suffering from astigmatism, you don’t have to settle for dry-eyes and other chronic eye problems. Thanks to the stability of the lenses, you can maintain the acute visibility throughout the day. So, you can engage in serious activities without noticing the lenses there. What are the potential drawbacks of the Dailies Aquacomfort Plus Toric? While these lenses are comfortable, occasionally, you may come across a rogue lens that doesn’t sit properly on your eyes. Usually, this occurs with one or two out of all the lenses in the box and at infrequent periods. You also may not be able to find any decent discount or promo codes for these lenses. For this reason, you may want to consider them a bit expensive. When you are suffering from astigmatism, it’s normal to experience blurred vision and even discomfort when you wear contact lenses. However, there is a solution that will allow you to wear them and feel comfortable in them. This is done with the help of toric contact lenses, which are designed for astigmatic patients. The Dailies Aquacomfort Plus Toric contact lenses are designed with two unique technologies that give you clear vision and consistent comfort throughout the day. With the TriComfort Technology design, you get a consistent flow of oxygen to the cornea. This will remove any comfort from the vision and make for whiter, healthier-looking eyes. It also doesn’t have any effect on your lens. And since they are hygienic, the chances of developing eye diseases are quite slim. This is as a result of 99% of these lenses having less than 50 oscillation with each blink. Our dedicated team reviews popular products, newly released items, and the latest scientific research. This is so that you always get the most up-to-date information. For more info on contact lenses or other eyewear products, check out our different categories. What works for others may not be suitable for you. So, do your due diligence before making any changes to your eye care routine.